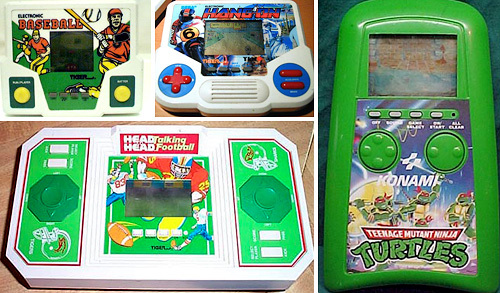 Mid-Week Time Waster – Handheld Games Museum | OhGizmo! As far back as I can remember I’ve always been a fan of handheld video games. From Nintendo’s classic Game & Watch systems to the hundreds that were produced by Tiger Electronics in the 80’s. Now that the GameBoy, NDS and PSP have taken over the market though these old-school games are hard to come by. But if you’re up for a little dose of nostalgia, or just want to waste a couple of hours at work I highly recommend checking out the Handheld Games Museum. The site literally has hundreds and hundreds of photos of old-school handheld games and I even managed to find quite a few from my own collection which are included in the shot above. If you find any games from your own collection please feel free to reminisce about them in the comments. Oh man these were great! The best one I ever had was a tabletop unit that looked like a machine gun. It had a base that rotated and the display would change as you turned. The object was to shoot the incoming tanks by rotating the position of the gun. Man I wish I knew what that was called! I had the TMNT game from the picture! I used to love it and hate it at the same time . . . whenever you wanted to jump you had to press the button so early that sometimes the oncoming enemy would hurt you before he even jumped. I also had a pinball one that had a blue plastic casing that I used to play . . . those were the days! Wow, that certainly takes me back. I do have one memory of this racing game where you drove a car and there were three lanes and you’d just move left and right to avoid the cars you were passing. The unit itself was pretty cool because it was like binocular shaped and the top had a translucent white area that let light down into the game to see the cars and track. If you put your hand over the top you couldn’t see the game through the eyepieces. The game had buttons on the left and right side for the fingers (just where you’d hold a pair of binoculars to see through) and one button was orange and the unit itself was sort of beige. Anyone remember what it was called? I actually still have that TMNT game. I got it for 35 cents from a yard sale. If you want some gaming nostalgia, then the Salv and yard sales are the places to go. I remember getting one of these as a wee little kid ( and I was born in 76! ), it was probably one of the first of these sort of games. It was a picture of a fox with a basket. The fox had to try and capture eggs as they rolled off a ramp.